Grease interceptors shall be Rockford Interceptors from Rockford Separators, Inc., Rockford, Illinois, and as noted on plans. Furnish ______Rockford Model R-POLY-______ polyethylene grease interceptor with a flow rate of ______ g.p.m. and a grease capacity of ______ lbs. Unit shall be of seamless construction capable of withstanding 212 degree F. continuous service. 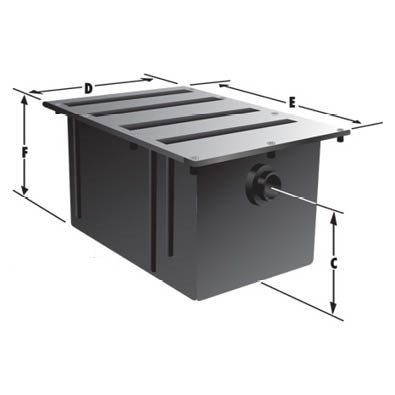 Standard unit is furnished with a polyethylene cover secured with stainless steel screws, cover gasketed by O-ring type gasket. _____ " female NPT inlet/outlet connections with external flow control device included with unit. Tank shall be certified by PDI-G101* standard and installed in accordance with local plumbing code requirements and manufacturer’s instructions. Aluminum thread plate covers for pedestrian traffic. Nonskid surface strips for covers: sizes R-POLY-.20 and larger.